Meanwhile, in a large skillet, cook beef and onion over medium heat until meat is no longer pink; drain. 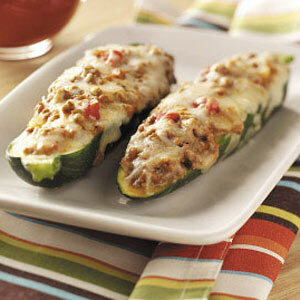 Remove from the heat; stir in the egg, marinara sauce, bread crumbs, salt, pepper and 1/2 cup cheese. 2 stuffed zucchini halves (calculated without additional sauce) equals 394 calories, 21 g fat (10 g saturated fat), 134 mg cholesterol, 602 mg sodium, 19 g carbohydrate, 4 g fiber, 33 g protein. One of the very low calories vegetable that is used during weight reduction and cholesterol control programs. 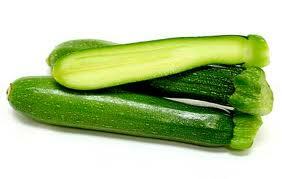 Zucchinis provide only 17 calories per 100 g. Contains no saturated fats or cholesterol. Its peel is good source of dietary fiber that helps reduce constipation and offers some protection against colon cancers. Fresh fruits are rich in vitamin A, provide about 200 IU per 100 g.
As a high-fiber food, zucchini can also contribute to colon health, including protection against colon cancer, as well as helping lower cholesterol levels.